We’re still getting hammered with the snow. I have no idea how it’s possible, but we STILL don’t have cabin fever. We are so very much enjoying the time together, especially with the quiet and stillness and the beautiful winter light from the snow. We went for a special walk this evening and it was so fun to get outside. Usually I’m the one inside waiting with hot chocolate while John shovels and Mia plays. This was such a nice change and a reminder of simple things that make you feel so so so very good. 45 minutes outside in the snow was so refreshing that i felt like a new person – this is definitely another great reminder to get outside, even when it’s cold and snowy. I literally can’t believe how good it made me feel and I know that my kids must need that just as badly as we’re so engrossed in everything happening in our day-to-day inside winter lives. Our walk outside tonight was an especially sweet time. 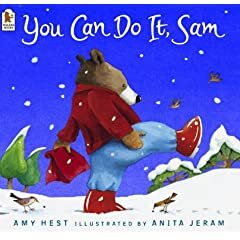 Even before all of this snow, You Can Do It, Sam by Anita Jeram has been a favorite around here. In the spirit of the book, she was so excited to take her cookies to our neighbors. We took cookies, walked around down the middle of the street saying hello to everyone who was out shoveling, built a baby snowman, licked some snow…you know, normal snow-playing stuff. I still feel guilty that we haven’t gotten a sled for her. We don’t have a good sledding hill nearby that I’m aware of, but I know she’d love to just go for a walk being pulled on a sled. I think we’ll need to get on that after this snow melts so that we’re prepared next time! Other fun: we took Nick outside in the snow for the first time! He wasn’t too thrilled, but it was also his bedtime and he was super sleepy. He’s the kind of baby that loves to just look around and take in everything around him to evaluate the situation, so he just looked around in awe before trying to take a dive out of my arms and into the snow. p.s. The cookies? Pioneer Woman’s Oatmeal Crispies. OHMYGOODNESS. Try them RIGHT NOW!! 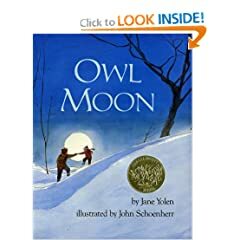 Any other suggestions for favorite books for children about snow? Oh wow, those books bring back memories of when my kiddo was younger!! I actually miss reading picture books (which I didn’t realize until I saw this post) :).